A cycad. 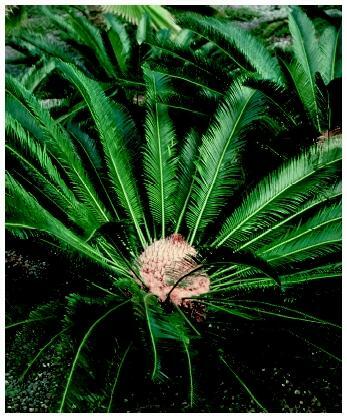 Most cycads superficially resemble ferns, but they differ in that they develop distinctive male and female cones. acid (DNA) has shown that the gymnosperms consist of four major, related groups: conifers, cycads, ginkgo, and gnetophytes. With approximately 588 living species, this is the most diverse and by far the most ecologically and economically important gymnosperm group. Conifers grow in all climate zones and on all continents except Antarctica. They all bear their seeds within a cone or a structure superficially resembling a berry (true berries only exist among angiosperms). Most conifers are trees. Conifers appeared in the fossil record about 290 million years ago and have been an ecologically important, widespread group ever since then. The 220 species of cycads are widely distributed through the tropical and subtropical regions. Most of them superficially resemble ferns, having a cluster of long pinnate (rarely bipinnate) fronds growing from a central stalk, but they differ in developing distinctive male and female cones. Cycads are woody, long-lived, unisexual plants. All species have coralloid roots, which support symbiotic cyanobacteria that can fix atmospheric nitrogen. The cycads and ginkgo are unique among seed plants in having motile sperm; this is often taken as evidence of their evolutionary primitiveness. Cycads appeared in the fossil record about 230 million years ago and attained their greatest ecological importance during the Jurassic period, about 193 million to 136 million years ago, when they formed extensive forests. There is one surviving species of ginkgo. It is a tree, sometimes attaining large size, native to China but widely planted around the world. Ginkgo is often referred to as a "living fossil" because nearly identical plants are known from fossils nearly 200 million years old. The fossil record shows that they were formerly a widespread, abundant, and diverse group. The gnetophytes are one of the most peculiar plant groups. They include three highly distinct groups totaling 68 species. One group, the genus Ephedra, is composed of shrubs native to deserts and semiarid areas. The second group, the genus Gnetum, is composed of climbing vines (and one tree species) native to tropical rainforests. The third group contains a single species, Welwitschia mirabilis. It lives in the desert of Southwest Africa, produces two leaves that grow throughout the life of plant, and lives an estimated two thousand years. Although the fossil record is virtually nonexistent, studies suggest that the Gnetales are a relatively young group that evolved from the angiosperms and thus are unrelated to the other gymnosperms. Earle, Christopher J. The Gymnosperm Database. 2001. <http://www.conifers.org> . Farabee, M. J. On-Line Biology Book: Biological Diversity: Seed Plants. <http://gened.emc.maricopa.edu/bio/bio181/BIOBK/BioBookDiversity_6.html> . Norstog, Knut J., and Trevor J. Nicholls. The Biology of the Cycads. Ithaca, NY: Cornell University Press, 1997. My cycad is turning yellow on the bottom fronds. Is there some fertiliser that I shouls be giving it and if so, what?